Every so often, I run across a product that is truly unique. The Ergon ST Core bicycle saddle is one of those products. Before we go any further, I know what you are going to say, “Unique isn’t always good john”. Fair enough, but in this case the unique features of the Ergon ST Core saddle immediately jumped out to me as a great idea! 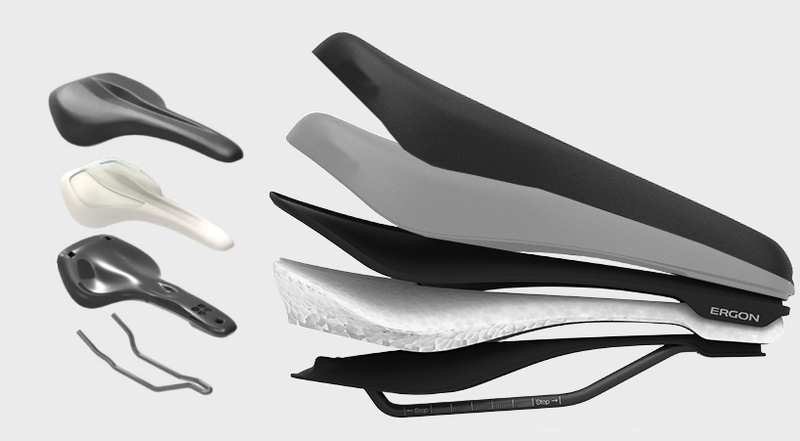 What makes the core bicycle saddle different? The Core saddle is actually two saddles in one. As an example, a typical saddle is made of 4 parts, the rails, the base, the padding, and the cover. The rails are the metal part that attaches to your bike. The rails need to be ridged in order to hold the saddle stable on the bike. Next, the base is the plastic portion of the saddle that holds the rails and padding. It also needs to be ridged. The padding mounts to the base and the cover holds the whole thing together. Basically, traditional saddles rely completely on the padding to keep you comfortable while protecting you from the ridged rail and base. The Ergon Core saddle is similar but adds a new dimension to comfort. like a standard saddle, It has a ridgid rail and base as well as padding and a cover. However, Ergon inserts an all new concept in saddle comfort – “the Core”. The core is made up of what appears to be a closed cell foam and a flexible plastic base material. Effectively, Ergon has isolated the seating portion of the saddle from the ridgid base in order to make a more comfortable saddle. The traditional saddle on the left is made of four pieces. The Core saddle on the right adds an additional base and foam layer. By isolating the rider and padding from the ridgid base, the core saddle does two things a traditional saddle cannot. First, the Core saddle can oscillate from side to side, equalizing pressure, as you pedal. This limits the pressure on your sit bones that can increase from side to side as you pedal. The second thing it does is absorb road shock. The isolating foam does an amazing job of eliminating road shock. 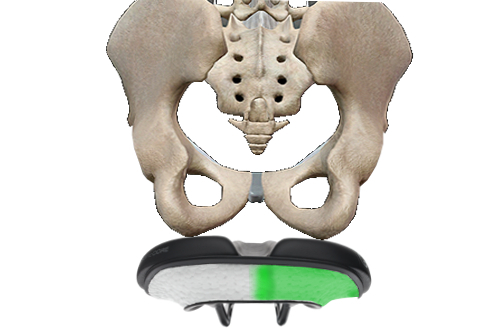 As pressure is increased on the right side of the saddle, the Core can accommodate. While the Core saddle offers more comfort than other saddles, it still needs to fit you. In an effort to fit riders best, the Core comes in four sizes in total. There are two sizes for men (Smalll/medium & Medium large) and an additional two for women. The shape of the saddle is changed to meet the different anatomies of men and women. I am really excited to try this product out. Additionally, I was measured out to fit into the large and will be commuting on it through our Minnesota spring thaw. 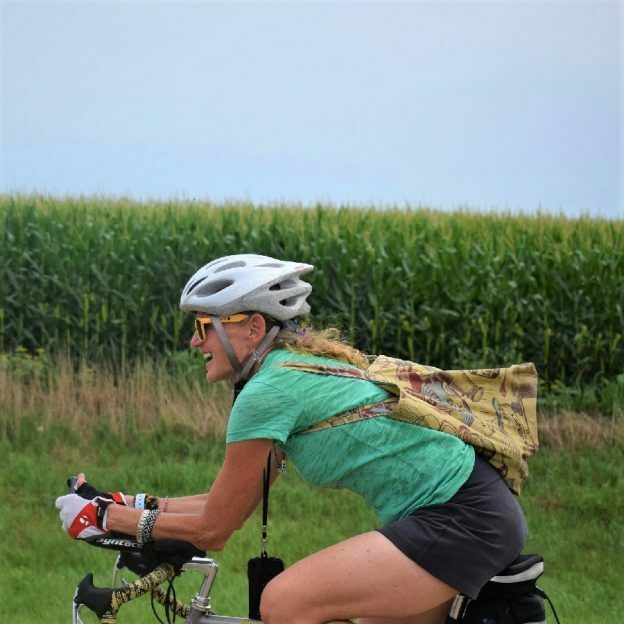 This entry was posted in News and tagged bicycle seat, bike saddle, bike seat, cycling saddle, cycling seat, Ergon, ergon bike, ergon bike seat, Ergon Core, Ergon Core Saddle, Ergon Core Saddle REview, Ergon Core ST, Ergon Core ST Saddle, Ergon Saddle Review, ergon seat, Ergon Seat REview, ergon ST Core Saddle Review, revolutionary bicycle saddle on March 17, 2018 by John Brown.